Arien Rozelle answers a question, flanked by student Natalie Gates, left, and faculty colleague Todd Sodano, right. Students and faculty gathered in Fisher’s Mainstage on Nov. 14 for an intimate panel discussion on gender equality and the climate around sexual assault. Fisher Media and Communication students Natalie Gates and Allison Baird created the “We is for Equality” event because they saw a need for a discussion on campus about gender equality and sexual assault. 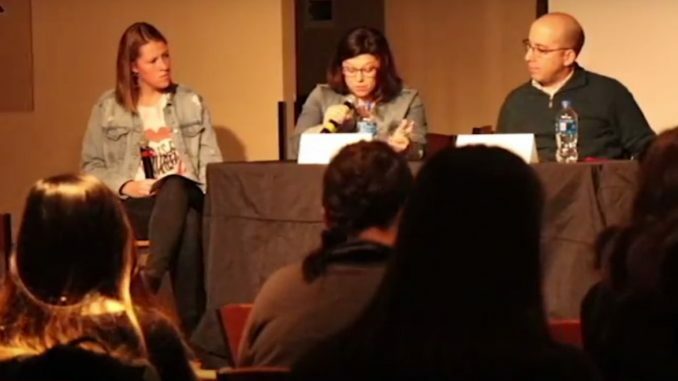 They gathered five faculty members of different disciplines to answer questions regarding equality and sexual assault from educated points of view. Each panelist brought a unique perspective to the discussion, along with personal anecdotes to keep the conversation from getting overly heavy. The discussion covered topics from a political standpoint to a more media centered point of view. Ruehl and Donovan were joined by Media and Communication professors Todd Sodano and Arien Rozelle, along with Lisa Cunningham, director of the Women and Gender Studies program. Rozelle and Sodano offered their perspectives on media portrayals of women, and the degree to which women are employed in media industries. Students that attended this event were fully engaged and appreciative of the honest discussion. Gates and Baird opened the floor to questions from the audience, and by the end of the event, students were having constructive discussions among each other and with the faculty regarding sexual assault and gender equality. Cardinal Chat: What do you do for Thanksgiving?